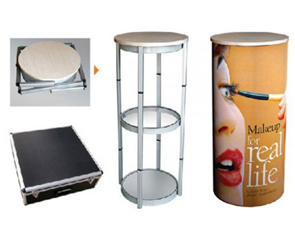 Round Portable Trade Show Counter with Printed Artwork - Dino Rentos Studios, INC. This Round Portable Trade Show Counter with Printed Artowrk is a great addition to any Tradeshow or Convention Displays. The Hard Top Style Portable Display Counter is a high quality, stylish designed promotional counter. It is easily assembled and comes with a carry bag. All folds down to a handy transportable size. The banner for the counters is fixed to the stand with Velcro for a simple setup.